For Christmas I received David Walliams' latest book: Awful Auntie which tells the story of Lady Stella Saxby and her truly awful aunt Alberta and her pet owl. Alberta is that woman who gets what she wants and when she wants Stella to hand over Saxby Hall, this aunt will do anything to get it. By anything, I mean anything. With her sidekick owl, Alberta is unbeatable, little does she know, Stella has her very own help. This was, as all David's other books are, totally hilarious and a light but mysterious read with unexpected twists. I thought I was at a point where nothing else really would happen but then BOOM! you discover that ----- actually is ----- and ----- is really -----. In this book, you can't just assume that everything's okay, because it isn't. Anything, could be anything and nothing could be something. Because of this, I found it a really enjoyable read where there were no points where suddenly, the writing just dragged on and became a bore. The excitement meter went up and up and then just as it begins to go down, it is janked back up again. I totally recommend this for all children 7+ even teenagers and I know that some adults would definitely enjoy it too. It is preferable for those who like comedy and mystery (like me) and for fans of David Walliams, I can tell you now, this does not disappoint. OMG! 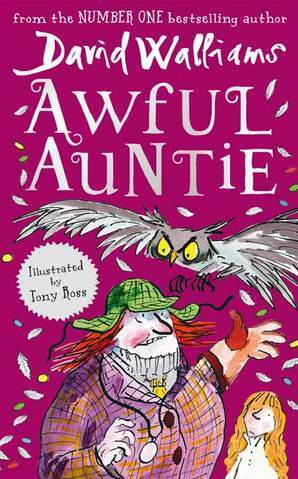 I love Awful Auntie! Oh I love this book! Great review Lexie! That looks like a good book! You won my giveway. Please check your email. I tagged you at my blog!